Brian Keith Thompson, owner of the Body Electric tattoo and piercing studio in Hollywood, says he is relentless in enforcing hygiene standards. Body Electric, a tattoo and piercing studio on trendy Melrose Avenue in Hollywood, has seen tattoos and piercings go mainstream. People need to know that some piercings take a lot longer to heal than others, the pediatricians say. Marciano is part of a trend; 38 percent of millennials have at least one tattoo, according to the Pew Research Center, and 23 percent have a piercing somewhere other than an earlobe. That compares to just 6 percent of boomers with tattoos, and 1 percent with other piercings. The nation's pediatricians, who want teenagers and young adults to be aware of potential health issues with tattoos and piercings, released their first-ever recommendations on health and safety on Monday. The report finds that most people who have a tattoo (86 percent) have never regretted getting one, and 30 percent says it makes them feel sexier. But despite the popularity of body art, "Most of my medical colleagues don't know regulations in the states, complication rates or later impact on young people when looking for a job," says Dr. Cora Breuner. She's a member of the division of adolescent medicine at Seattle Children's Hospital who chaired the AAP Committee on Adolescence that wrote the recommendations. Breuner says she wants doctors and other health care professionals to be able to appropriately guide patients and their parents when a tattoo or body piercing is being considered. That includes being aware of regulations in their state. The federal government does not regulate the industry and rules vary from state to state. In some states, minors as young as 14 can get tattoos if they have parental permission. And when it comes to sanitary conditions, there is wide variation in state regulations. The AAP recommends that pediatricians talk with adolescent patients about the importance of hygienic practices in piercing and tattoo parlors, including making sure practitioners use new disposable gloves; needles from a sealed, sterile container; and fresh unused ink poured into a new disposable container with each client. This means infection control "just like in a doctor's office," says Breuner. At Body Electric, owner Brian Keith Thompson says, "I want to leave the studio today the same way I came in — disease-free." He sets employees to work every morning cleaning floors and equipment. "I'm a former Marine, so I am the commanding general inspecting it," he says. His state, California, sets standards for sterilization, sanitation and safety for both tattooing and body piercing. Practitioners have to register with the state health department and are required to submit proof of hepatitis vaccination as well as take a yearly course in bloodborne diseases and infection control. While infection is rare, concern about infectious diseases such as HIV, hepatitis and skin infections caused by Staphylococcus aureus (staph) bacteria remain. People on medications that inhibit the immune system and can affect the healing process, such as steroids or Accutane, should avoid both tattoos and piercings, the pediatricians say. And everyone should be up to date on immunizations, especially tetanus. After the procedure, the doctors say patients should watch for signs of infection, such as redness that spreads beyond the tattoo or piercing, increasing pain, or fever. If this happens, Breuner says, "go to the doctor." And doctors and patients should understand that healing times differ depending on the piercing. For example, an ear piercing may take just a few weeks to heal, but a piercing in the tongue can take up to six weeks, and a belly button piercing up to nine months, Breuner says. And there's the key point that tattoos are permanent. Even though he owns a tattoo parlor, Thompson says he often counsels teenage clients against tattoos that are easily visible on the hands, neck and fingers. "I'll tell them no, you're 19, you should wait," he says, adding that many professions are still conservative when it comes to tattoos. "Definitely stay away from the face," says Thompson. "We call that the job stopper; if you don't want to get employed, tattoo your face." And understand that tattoo removal by laser is painful, difficult, expensive and only partially effective. 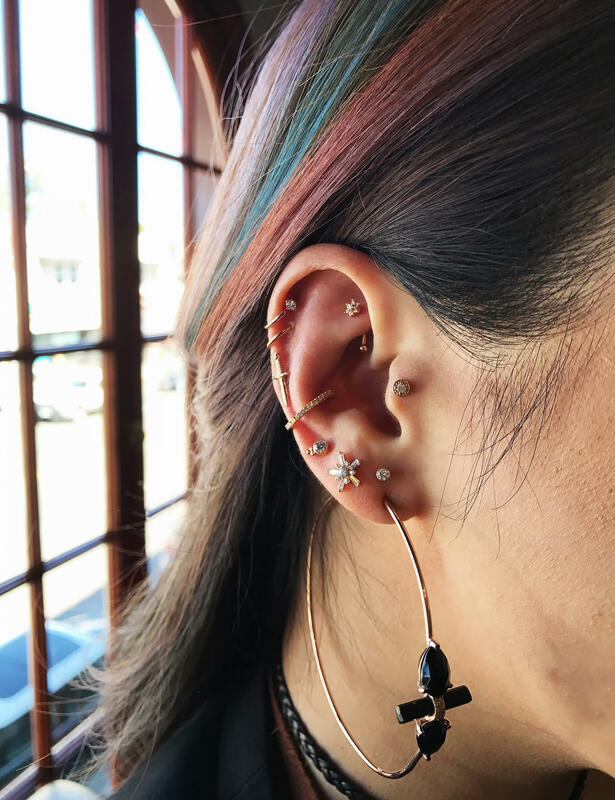 And now the latest news from the American Academy of Pediatrics - at their national conference in Chicago today, the academy is announcing new recommendations on tattoos and piercings for teens and young adults. Here's NPR's Patti Neighmond. 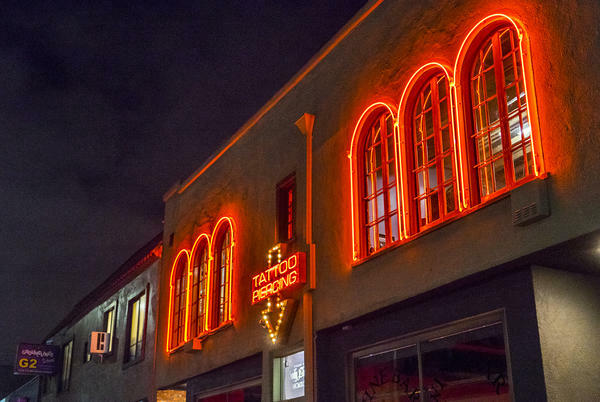 PATTI NEIGHMOND, BYLINE: On Melrose Avenue in Hollywood, climb a steep flight of stairs, and you're in a space filled with artwork and primary colors - the Body Electric tattoo parlor and piercing studio. Owner Brian Keith Thompson says he's never been so busy. BRIAN KEITH THOMPSON: I feel like everyone has to be pierced now. It is a phenomenon. NEIGHMOND: Piercings and tattoos are no longer the realm of bikers and gang members. THOMPSON: When I first start getting tattooed in 2001 in this studio, I didn't see mothers and daughters getting matching tattoos. THOMPSON: Flowers are getting big. Trees and root systems - that's real big right now. NEIGHMOND: And for people in their 20s, it's not just one tattoo or piercing - it's multiple. Take 23-year-old Ariana Marciano. She has 10 piercings and 75 tattoos. ARIANA MARCIANO: I think that they're so cool. And I think they're, like, visually, really nice to look at. NEIGHMOND: There's a praying mantis, a ram's head, a moth. Today, she's getting a ladybug. NEIGHMOND: Dots on it back, a bit of rusty orange, and it's done in about 20 minutes. Because body art's now so mainstream and more teenagers are getting tattoos and piercings, pediatrician Cora Breuner says doctors need to be talking to patients and parents about them, which is why she and colleagues with the American Academy of Pediatrics developed guidelines to help doctors answer questions. First off, she says, doctors need to emphasize to patients that it's up to them to make sure the tattoo and piercing studio is hygienic. CORA BREUNER: ...That the needles that are being used are pulled out of a clean, sterile packet, that the person doing the piercing or tattooing is wearing gloves. NEIGHMOND: While infection is rare, she says, doctors should know symptoms and explain them to patients - for example, redness that spreads beyond the tattoo or piercing, increasing pain or fever. Before getting a tattoo or piercing, immunizations, especially tetanus, should be up to date. And with piercing, it's important to know healing times differ. BREUNER: For example, if you get a piercing in your ear, healing time can be anywhere from one to two weeks. But if you get a piercing in your tongue, it can be up to six weeks. If you get a piercing done in your bellybutton, it could take up to nine months for that to heal. NEIGHMOND: And of course, with tattoos, the main thing for a young person to bear in mind is that they're permanent. Body Electric owner Brian Keith Thompson often counsels young clients against tattoos that are easily visible on hands, neck and fingers. THOMPSON: And I'll tell them, no, I think you're 19. I think you should wait. NEIGHMOND: Many professions, he says, are still conservative when it comes to tattoos. THOMPSON: Definitely stay away from the face. We call that the job stopper. You don't want to get employed, tattoo your face. NEIGHMOND: Tattoo removal by laser is difficult, expensive and only partially effective. Patti Neighmond, NPR News. (SOUNDBITE OF THE ADMIRAL'S "TRUNK POPPED") Transcript provided by NPR, Copyright NPR.